Don’t Miss Out on the 2017 Summer Youth Media & Tech Camps! Registration Is Now OPEN. During our weeklong SUMMER camps, youth get to flex their “technology” muscles through creating an original movie from start to finish. 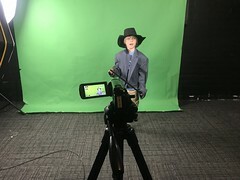 Campers, ages 6-15, will learn how to operate a camera, edit in iMovie, create storyboards and use our Green Screen Studio! A matinee of the youth’s film projects will be premiered on the last day of camp to a full house in our independent movie theater, the Digital Gym CINEMA! Visit Media Arts FLICKR page to see our YMTC Campers in action or watch videos from past camps. We’re improving our after care with new, fun activities for kids to play and learn! Scholarships: Need-based scholarships are available. Please sign up here.